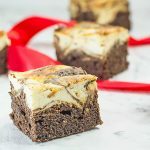 Two delightful sweet treats baked into one, if you love brownies and cheesecakes, you’ll love this Keto Brownies Recipe! They’re fudgy, chocolate-y and very, very delicious. Preheat your oven to 175C/350F. Place the sugar free chocolate and butter into a heatproof bowl and place over a saucepan of simmering water, ensure that the water isn’t touching the bowl. Melt the chocolate and butter and stir well. Remove from the heat. In your stand mixer, using the paddle attachment, add the Natvia, coconut flour, cocoa powder and baking powder and mix well on low speed. Pour the chocolate and butter into the stand mixer and mix on low speed while adding the eggs one at a time. Scrape down the sides of your stand mixer and mix on medium speed until the ingredients are well combined. Pour the mixture into a lined 9x9in brownie tin or 10in cake tin and set aside. Clean your stand mixer bowl, add the whisk attachment and add the cream cheese. Add the Natvia, vanilla and egg and mix on medium speed until smooth. Place dollops of the cream cheese mixture on top of the brownie mixture and using a small pallet knife, swirl the cream cheese into the brownie mixture. Gently tap the brownie pan onto the bench to remove air bubbles. Place the brownie into the oven and bake for 45-50 minutes. The brownie is cooked when it springs back when touched in the center. Leave to cool for at least 30 minutes before cutting into 20 pieces and enjoying. Store leftover brownies in the fridge, in an airtight container, for up to 1 week. Or freeze for up to 1 month.